The Chinese Crested is a good companion animal, and is always there to cheer you up. They are loving, lovable, affectionate, gentle, happy, lively, entertaining, and love to play. 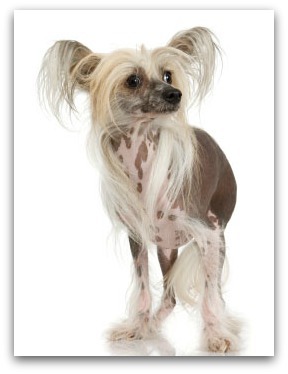 The Chinese Crested is an old breed originated in Africa, with the Chinese developing these breed. In Africa they were called as "African Hairless Terrier". After the Chinese sailors kept the dogs aboard ship as vermin hunter, they renamed the dogs "Chinese Crested". The breed was also known as the Chinese Edible Dog, which can give you a clue to breed other purpose in China. They are often shown in rare breed dog shows. These breeds of dogs was registered with the AKC in 1991. The Chinese Crested is found in two very different varieties, which are Powderpuff (with hair) and Hairless. The Powderpuff variety having a long and soft coat, silky guard hairs over a silky undercoat. The Hairless variety is just that, hairless, he has hair on the head, and crest of the neck, the fett, and the tail. Both powder puff and hairless varieties can be born in the same litter. The coat colors comes with any color, either solid, mixed or spotted all over. They are a very intelligent breed and has the ability to perform small tricks. One Early socialization and obedience classes is a good idea. Let's the dog learns how to learn, and get to meet different variety of people and other pets. Housetraining can be challenge, however training with patience and consistency and should have a gentle trainer, these could be done well. Chinese Crested are very clean, virtually has no doggie odor at all. Grooming the Hairless consists of bathing the dog with using the moisturizers to keep it healthy. Should always protected him from the cold and the sun. These breed is very suitable for allergy sufferers as these dogs shed little or no hair at all. The Powderpuff requires twice weekly brushing to prevent tangles and mats. Taking extra care when the dog is shedding. They are rarely barking or nipping, this dog is well mannered and gentle. The Chinese Crested is an elegant little toy dog who craves human companionshipis willing to please his owner. They are devoted family member, They tend to become very attached to their owners. They do well in families with gentle children. They don't like to be left alone, and might just chew your favorite slippers. Chinese Crested Dogs like to climb and dig holes. These dogs are alert, charming, gentle, lovable, Affectionate, and playful with children.